Our newest Blogger Style crush is the gorgeous Vicki from the blog ‘Magpie Girl‘. Vicki’s blog is a diary of her outfits, with lovely photographs set in some dreamy locations. It also consists of the occasional fashion ‘Lust List’ where she shows her readers what she is lusting after from various stores. Vicki challenged me to recreate this look in particular, which featured in this post, and I’m so glad she did! I adore this look and the way she has successfully clashed not on. not two, but three different prints in one outfit. It looks effortless and has a real individual feel to it. On paper, mixing checks, houndstooth and diamonds sounds like a fashion disaster, but Vicki pulls them off with ease and manages to look incredibly cool and quirky. Vicki wears a shirt dress (worn as a top) by ASOS, a high waisted skirt from River Island, a waist belt from Miss Selfridge, tights and boots by M&S, and carries a leather bomber jacket from Oasis. 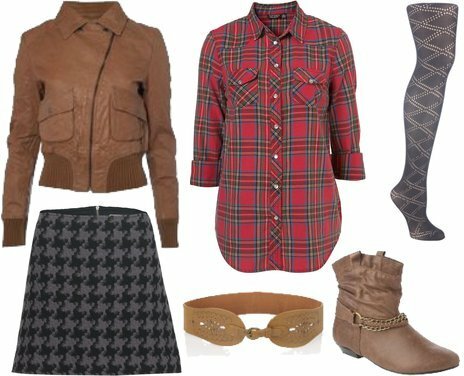 To recreate her look, opt for a checked shirt in a bright red and team with a skater style skirt in a grey and black houndstooth skirt. Neaten up the join of the two with a thick statement waist belt in tan and pull on a pair of diamond patterned tights in grey or black. Add a pair of flat ankle boots with chain detail, and a leather bomber jacket in tan, and there you have it! A fashionable way to mix fabrics and prints, creating a fun look for the colder weather. If you like Vicki’s style and want to see more of her fabulous outfits, be sure to take a look at her blog, Magpie Girl. Justin Timberlake's Fashion Clothing Line Goes Live!